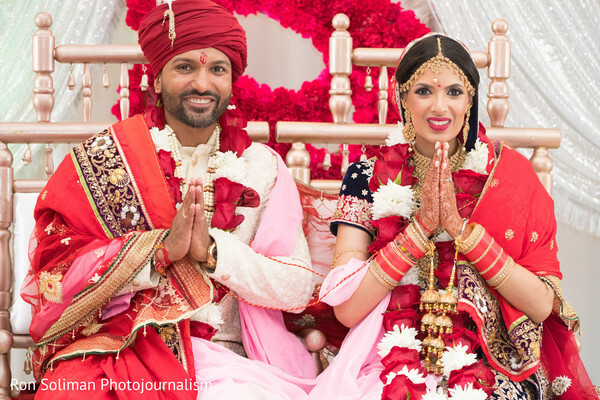 After a much needed holiday season, it is time for a big and romantic Indian wedding! Today we celebrate the beautiful wedding story of Anita and Rushang. 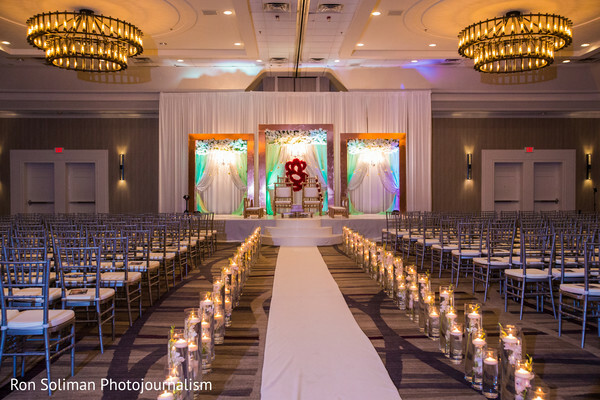 Entirely captured by Ron Soliman Photojournalism at the Hanover Marriott, this luxury union had the best wedding spaces and superb details! 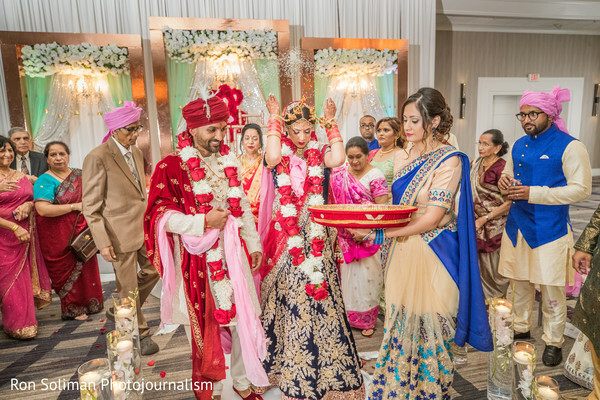 Starting with a sprightly baraat with Caliber Farms’ steed and continuing with a lush ceremony décor designed by Partyland Event Design Boutique, every element set the scene for the sweet ceremony. A ravishing set of three floral arches and a trio of chandeliers defined the wedding theme flawlessly while the natural beauty of Marani Anita took the main stage! She donned a navy blue lehenga, a floral updo and bright pink lips created by Heena Das Beauty. 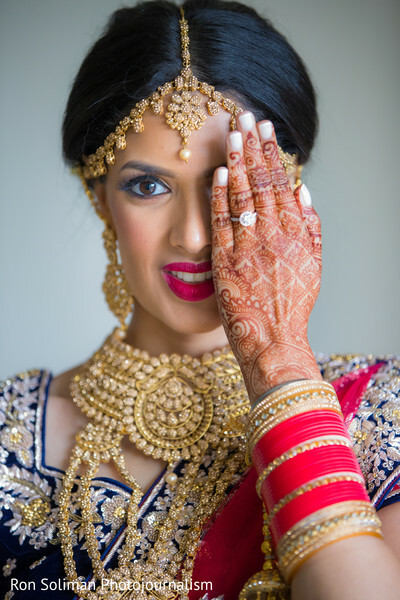 Mehndikalogie made our bride looked even more gorgeous by embellishing her hands and feet with an astounding mehndi design that finished off such glorious attire! 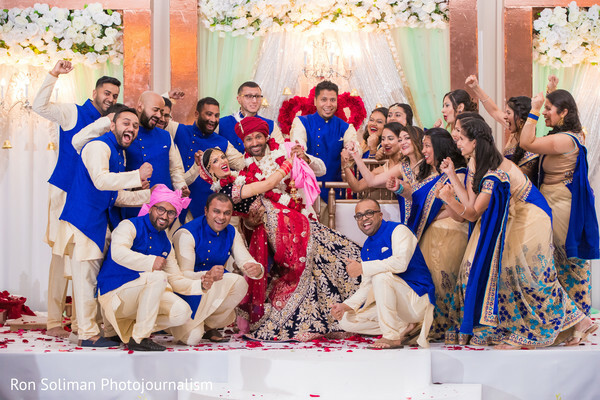 Check out the wedding highlights of Anita and Rushang in our full gallery now! My husband's name is Rushang Patel. According to my close friend, (who is a mutual friend of ours) we had met each other many many times over the past 10 years. However, we never really paid close attention to each other. Either I was dating someone at the time or he was dating someone, or we were just star-crossed lovers. On October 31, 2015, it was written in the stars for us to meet again, but this time it was meant to turn into a lifetime bond. I was attending my best friends 30th birthday, and Rushang was attending his close friends birthday in New York City. It turned out that my best friend is his close friend's cousin, and they were having a joint birthday party. It was a Halloween party, so I was dressed as a fairy in a tutu with wings. Rushang's personality is very much like the life of the party, and a unique individual. He was wearing a very hideous looking "peace" sign mask that immediately caught my attention, being that it was very random. We both enjoyed the party with our friends, and eventually, he literally swept me off my feet and carried me to the dance floor (randomly of course). Here, Rushang told me I finally was able to get you away from our friends so we can talk to each other. We proceeded to dance and talk the night away until it was time to go. The time went by so fast in my mind, however, we had been slow dancing (during fast music) and talking for almost two hours. He asked me for my phone number because he wanted to keep in touch with me after that night. Knowing that he was friends with my best friend, I trusted him enough to go ahead and take the plunge. Later, I found out that Rushang was actually there for that one weekend after being away for over a month. I learned that Rushang was going to be away in Quantico for six months of training. We talked over the phone and Skype for a month after we met, before our first date. Our first date was at a hibachi restaurant in Jersey City, followed by a private night time tour of Ellis Island where we could see a beautiful view of the NYC skyline and Statue of Liberty. I didn't know he was the one until approximately one and a half month after our first date. At this time, a blizzard had passed, and we were snowed in on a Saturday. Sunday morning, Rushang and I went down to dig our cars out. I realized that I left my second shovel at my parent's house, so there was only one shovel. He sent me back upstairs to my apartment, after my attempts of borrowing a shovel from someone to help Rushang was unsuccessful. I was able to see the parking lot from my apartment, and I periodically checked to see if he was done digging the cars out. Our cars were done in 45 minutes, but he was out there for over an hour and a half. After a while, I went to the window to see what was taking him so long. That's when I saw that he was helping all my neighbors in the parking lot in digging their cars out. He helped at least five other people that day, and that's when I knew that he was the one. After 7 months of being together, Rushang was stationed in another state for work, which led us to have a long distance relationship. That same year we had reached our one year anniversary of dating on October 31, 2016. He came home for Christmas and New Years in 2016, and I thought he was going back after new years. Well, he decided to surprise me by extending his stay for an extra week. I knew something was fishy because he never does that! We did date nights often, so on Friday, January 6, 2017, we had a date night planned at The Liberty House in Jersey City. One of my friends told me to wear something nice, and my sister in law told me to paint my accent nail rose gold (I have a rose gold obsession). Both also was weird, because I always do my nails, and I always wear a nice dress when we go out. So I had an idea that something was going on. We got to Liberty House, and Rushang said why don't we go outside (in 30-degree weather!). Even though it was bizarre, I just listened and went outside with him. At the Liberty House, you can see the NYC skyline in their outdoor section. That's where he got down on one knee and popped the question, and I said YES! My brother in law was right behind us taking pictures. Afterward, we had our dinner, and all our family and friends were waiting for us at a bar to celebrate our special night with us. My ring is very special to me. The center diamond has a halo of rose gold with pink diamonds in it, which brings out my personality to perfection and it was exactly what I wanted. Many years ago, I had seen that specific ring on a website and I fell in love with it. I had told my friends that one day when someone decides to marry me, this will be my engagement ring, and now it is! Initially, the whole planning process seemed so overwhelming, but once I got the venue, everything else just fell into place. I chose all my vendors based on their creativity, character, personality, and compassion. I met so many people, and not everyone makes you feel like family. Teresa Gasper was our venue manager at the time, and she truly made me feel like she was giving me her home to get married in. Heena Malhotra Das was my hair and makeup artist, and she listened and understood all the little details I wanted for my looks. She never pushed any ideas on me, and that is what made me feel so comfortable that I could blindly trust her in her artistic abilities. She made it a point to make my looks unique for all four of my events (we had a Garba on Friday and a Sangeet on Saturday before the wedding weekend). I don't have any sisters, and she made me feel like my sister was getting me ready for my wedding. Not only did we have a great relationship with me being her client, we carried on our relationship afterward and are now good friends! Similarly, Sachi Sood from Partyland Sajawat understood that I had no idea what I wanted as far as a theme, and knew nothing about decor, but I knew that colors were important to me. She spent time getting to know me and my personality, then made my decor look like a reflection of who I am and symbolized my personality. I wanted rose gold somewhere during each event. Subtle, but significant enough to catch your eye. She specially ordered rose gold frames for my wedding, and made special rose gold centerpieces for our estate tables. We both worked together to make our vision come to life, and to give our decor a tasteful and unique look. Ron and Bless Soliman are the power couple of photography! They are two of the most nicest and humble people I've met. They are so good at what they do and make you feel like you are their family. They always are full of surprises and give such cute presents. I couldn't have gotten through our wedding day without such heartwarming photographers. They made us feel very much at ease and ensured that we had a good time and remembered to keep us smiling. When my dad passed away, we needed a picture of him for his services, and Bless had sent us the PERFECT and most beautiful picture of him in the span of minutes. We are forever grateful to both of them for their compassion and love. Daniel Inzitari is one of the most creative cinematographers I've had the pleasure to meet. His film school background shines so beautifully in his work. His subtle creativity with using voice-overs, his organization, his camera angles, his fun-loving nature made it so easy to act natural in front of the camera. I could watch our wedding highlight film for hours and never get tired of it. His creativity and choice of instrumental music were perfect for all the scenes in our highlight film. DJ Gaurav is our longtime friend and such a humble human being. He was so attentive to all our needs and did a great job mixing Punjabi, Hindi, and American music for all our events. He is very good at reading cues and could tell when to transition to ending father daughter and mother son dances based on fatigue and body language. His attention to detail is impeccable, and he is so amazing that Rushang's baraat went on for an hour! People could not stop dancing! Palav Desai from Padma Graphic Design did our programs, place cards, and table numbers. I spent countless hours editing draft after draft. 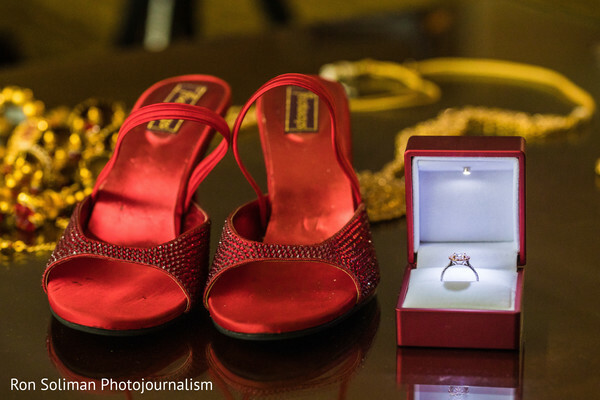 Her patience and hard work on the details of our wedding made even the smallest items stand out to our guests. 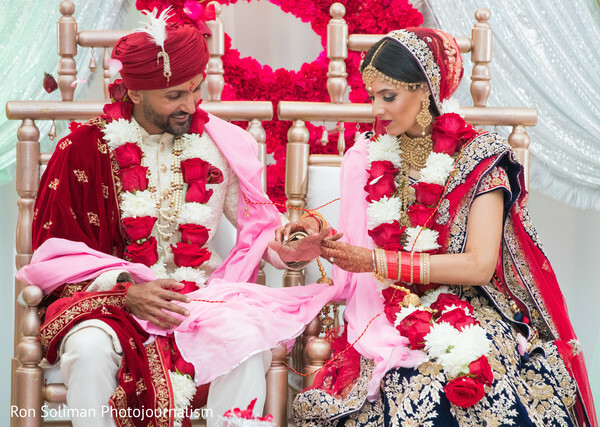 Brijen Patel did an amazing job with my husband's safa and all of our family member's safas. He especially went up to my Dad's room as he was having a hard time walking back and forth due to his illness, which meant so much to me. I couldn't be happier with our amazing team, and would blindly trust each and every one of these vendors for all my future events. My family is from Delhi, India so I went shopping in Delhi. I bought both my ceremony and reception outfits from Frontier Raas in South Extension II, New Delhi. I always knew that I didn't want an all red lengha. Many years ago, I had seen someone wear a velvet blue lengha with a red dupatta and I fell in love with that idea. I tried on a couple of velvet blue outfits, but I kept going back to the first one. I also tried one full red one on too, but it just wasn't for me. I tried the first one on one more time and looked at my Dad. That look of love and emotion from him is when I said Yes to the dress, a moment I will never ever forget. My reception outfit I designed myself. I love sparkle and glitter and wanted sequin in my lengha, but I wanted something that no one had ever seen before. I tried on things that had sequin, but nothing met my expectations of the kind of sparkle I wanted. I had seen a lengha with a gradient sequin look and showed my inspiration to the designers at Frontier Raas. They realized that I wanted something specific and decided to make my vision come to life. My skirt has small mirrors that were all put on by handwork on the bottom that transitions into gold sequin, and then silver sequin. There is an underskirt of lace under the net which the sequin sits on which gives the skirt the elegant but light look I wanted. The waist of the skirt has scalloped edging. Being that I am a Hindu Punjabi, traditionally we wear Chooda on our wrists when we get married. I wanted a red border on the bottom of the skirt to match the chooda. My pink dupatta was hand embroidered to have red flows to match the chooda, and white flowers to give it a contrast. It also had scalloped edging to match the waist of the skirt. I designed a light sleeveless blouse with light sequin to give the skirt and dupatta more of the spotlight. It took three to four months for Frontier to make my reception lengha, and I was so incredibly happy with their hard work and dedication. We had a lot of WhatsApp chats back and forth which helped me feel comfortable in trusting them to do an amazing job. The day of the events is when all your hard work pays off. From dances, outfits, to the decor and programs, from place cards to table numbers, from DJ to Photography, and from cinematography to a black light up dance floor. That feeling I got when my vision came to life, was the greatest feeling. Our guests loved our first dance. I spent months doing the choreography for it, and it came out perfect. One day Rushang and I were listening to the DJ NYK podcast, and the song Soch Na Sake was remixed into it. It was the first time I had heard that song, and that day I knew that it was going to be our song. Not only did it have a romantic part to it, but it also had parts with EDM music that my husband loves. Our performance had a mix of ballroom dancing, freestyle, and a tiny touch of classical. It was the perfect portrayal of our separate personalities, and our personalities together. 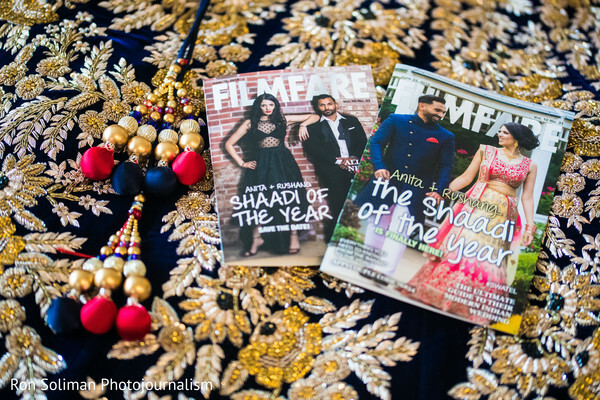 Our guests also loved our Filmfare magazine wedding programs which I designed myself, and our graphic designer (Palav) brought them to life. Our table numbers and place cards were also a design of mine that she brought to life with glitter paper that matched our black, silver, and rose gold glitter theme. I also received many compliments and texts about all my outfits and where I got them from. Lastly, we gave coasters as party favors at our reception and our guests loved them and utilize them all the time. There were 4 colors and each color had a different quote, our names, and our wedding date. My Dad's Speech and our Father-Daughter Dance is something that I remember very distinctly. I was so concerned for him, and whether he was going to be able to give the speech and dance with me despite having Stage 4 Gall Bladder Cancer. He pulled through, and he did it all so well. I will never forget his strength, and I am so proud of him for battling something so painful to make it through our wedding gracefully. 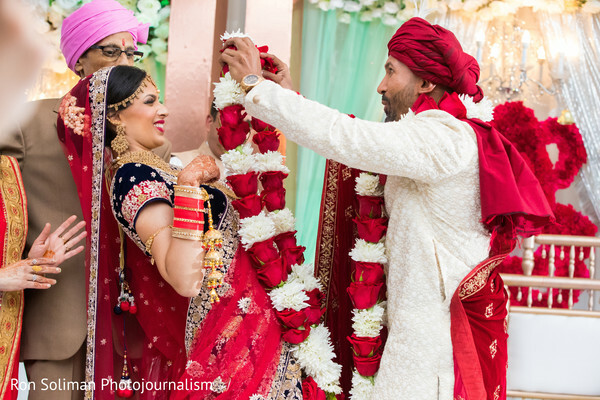 My husband is Gujurati, and we had a Garba on June 15, 2018. I wore a sea green Swati Manish Lengha from Mumbai. The decor was a Morrocan themed decor by Partyland Sajawat. We had a Sangeet on June 16, 2018. The theme was very colorful and Punjabi themed decor. That day I performed a very special dance incorporating my family, and my new family which brought the entire room to tears. That dance is very special to my entire family as it's the last memory we all have together with my Dad. We had a traditional Punjabi Jaggo and Boliyan which was the highlight of our sangeet. Everyone really enjoyed it and it was so much fun! I wore a magenta and light yellow/cream lengha from Frontier Raas. Wedding Planning seems so overwhelming at first, but everything falls into place the way it's supposed to. I'm so glad I followed my heart by choosing all my vendors. They were all so supportive, and there for me, my husband, and my family during our toughest and happiest time. My biggest and most important advice to brides out there is to follow your heart when choosing your vendors, your outfits, and every single detail during your wedding. Don't settle for anything less than what you dreamed of! Mehndikalogie did my mehndi and Dhara was so wonderful! I love elephants and she incorporated elephants in my mehndi on my feet and hands. She was so flexible with timing and positioning when she was completing my mehndi. Her artistic ability is the best I've ever seen and I truly commend her for her attention to detail and creativity. Not only are Dhara's designs beautiful, but her mehndi ingredients are organic and leave a beautiful color on both your hands and feet. Usually, mehndi doesn't come out dark on the dorsal side of my hands, but for the first time, it came out perfect all because of Dhara and her natural mehndi ingredients. Her assistant who did my family's mehndi was very professional and did a fantastic job. I enjoyed chatting with her, and we had some good laughs while she was applying my mehndi as well. The Hanover Marriott was the perfect venue. I only wanted hotels out of convenience. When I looked at venues, the things that stuck out to me always were the ballroom carpet, lobby, and overall ambiance. The Hanover Marriott had a modern ambiance, and that's what I loved about it. See you in a bit for all the details and best moments of Anita and Rushang’s wedding bash! 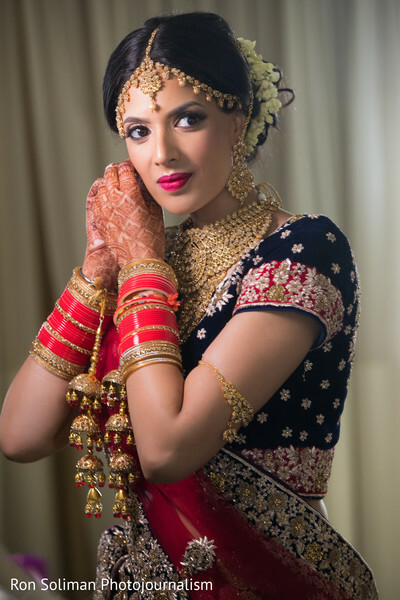 Partyland Event Design Boutique, Mehndikalogie and Heena Das Beauty are members of the Platinum Guide. Love what you see? Explore their portfolios.